Slice the tuna loin into 25cm x 3cm x 3cm. Brush the tuna with olive oil. Quickly sear the loin until the loin has changed its colour. Roll each piece into the black and white sesame. Cool then store in the chiller while prepping the other ingredients. Once cooled, slice equally into 30 pieces as demonstrated in the picture. Cut each peach halves into six segments. Heat up the butter in a non-stick pan. Roast the peach to a golden brown glaze. Toss the lettuces with the vinaigrette and arrange as per the picture. Steep the tea for 8 minutes and strain. Whisk in the olive oil and lemon. Roasted peach segments as a fan (3 pieces p/p). 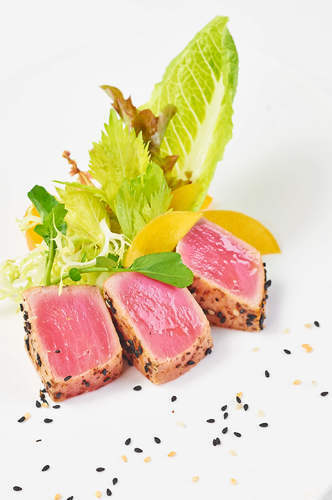 Arrange the 3 pieces of tuna tataki at the opposite of the peach in order to form an ovaloid shape. Arrange the salad in the middle, the romaine leaf taking support on the peach segments allowing the salad to be upward.